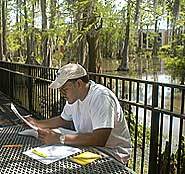 The University of Louisiana at Lafayette offers high school seniors an opportunity to earn college credit before they set foot on the university's campus. The High School On Site Program brings UL Lafayette to selected high schools by offering college level classes in mathematics (math 105) and English (English 101). The High School On Site program provides a bridge for graduating seniors as they prepare to leave high school and enter college. Those students who wish to enroll in the program must meet UL Lafayette admissions requirements. The program will provide personalized instruction from UL Lafayette faculty as well as a chance for high school seniors to earn college credit before graduation. Class sizes will be limited to 25 students and the classes will be taught at the high school. For more information visit http://universitycollege.louisiana.edu or contact your high school guidance counselor.